We’ve been out to Fort Davis, Texas dozens of times, but never actually took the time to stop into the place that gives the town its name. We typically try to get out to wilderness areas to camp and hike and try to avoid places that come off as overly touristy. We were missing out. We had a lot of fun here, and what we thought was going to be about an hour of our day turned into a little over four hours of walking and exploring. You’ll find the entrance to Fort Davis National Historic Site on the North side of Fort Davis, Texas on Highway 118 (inside the city limits). After parking, it’s a short walk to the visitor center. Note the discrepancy with Martin Luther King Jr. Day being closed and a fee free day. The fee is $7 per person over 16 years old, and free for those under 15 years old. You can buy an annual pass to the site for $30 which will admit the pass holder and three other adults for one year. Entrance is free if you have a national parks pass. 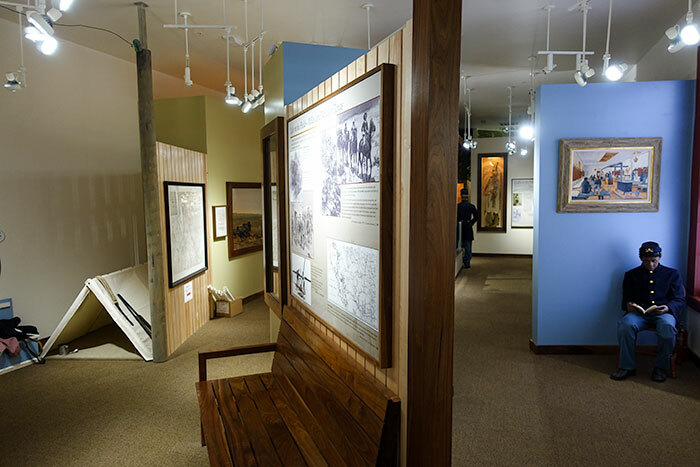 There is also a museum you can walk through in the visitor center. The historic site doesn’t have a tour guide (it’s self-directed) but, you’re given a pamphlet regarding the bugle calls and a map of the buildings and site layout. So it’s easy enough to guide yourself. There’s also a film you can watch in the visitor center to get oriented and get some background on the fort before you start your walking tour. Plan to wear sturdy shoes as there is a large area to cover walking around, plus a few trails. There are three water fountains on the grounds, which are turned off from November to March. You can also buy bottled water at the visitor’s center. We expected our visit to be a lot shorter, so we didn’t bring any water or snacks with us. We might have stayed a little longer, but hunger and thirst drove us back into town for a late lunch. Also, if you have a dog, they’re allowed, but have to be on a leash no longer than six foot. 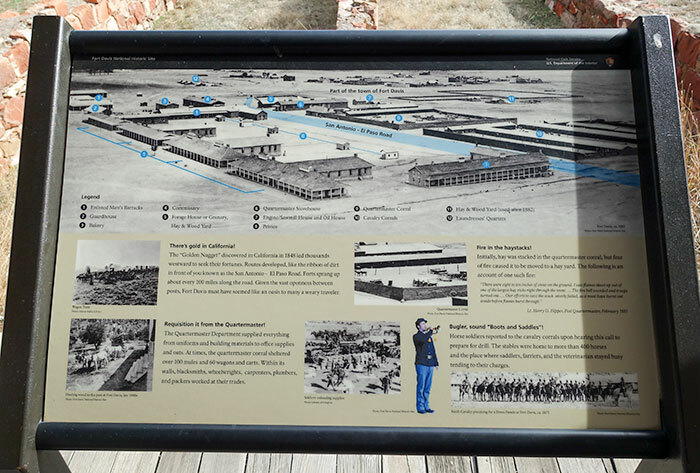 While walking the grounds you can enter officers’ residences, two sets of barracks, warehouses, a magazine (where they kept the black powder for their guns), the hospital, and other buildings. There is also a quarter mile trail to a cemetery, although the graves were removed and only markers left. In addition to walking the grounds, there’s a trail system you can hike. We’re planning a trip back so we can spend a little more time checking out their trail system. I highly recommend the trail to the scenic overlook. It is a steep climb but gives a great overview of the grounds. 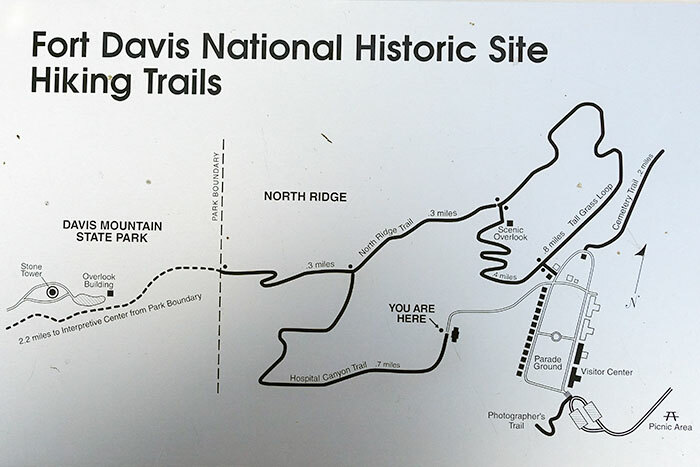 Note that while there is a trail connecting the Fort Davis National Historic Site and Davis Mountains State Park, the site is part of the National Park Service and the park is part of the Texas State Park Service, and each requires a separate check in. If you’re going to just do a quick out and back hike, I wouldn’t worry about it though. Initially, a passage was needed through the vast wilderness of the mountains and desert of West Texas. So, in 1848 an expedition was organized and led by Colonel John Coffee Hays to survey and develop routes between San Antonio, El Paso, the Gulf Coast, and Chihuahua, Mexico. Even in the company of Delaware Indian scouts and Texas Rangers, the group only made it from San Antonio to the intersection of the Llano River and San Pedro River which they couldn’t find a route past. At that point, the expedition was deemed a failure and the group had to turn back. In January 1849 a new party set out which followed part of the Hays route, but this time made it all the way to California. With the gold rush, it became important to establish a safe route from Texas to California for immigrants and commercial freighting. With the success of this new expedition, the US Army sent engineers and surveyed the area, creating a passage from San Antonio to El Paso. 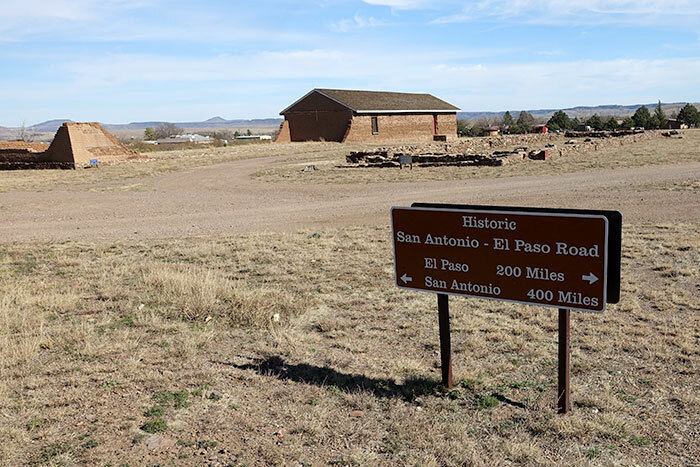 This road that was now established between San Antonio and El Paso was an important route for carrying mail, freight and passengers, and became known as the San Antonio-El Paso Road, Lower Emigrant Road, and Military Road. You can still see the San Antonio-El Paso Road running though part of the fort. 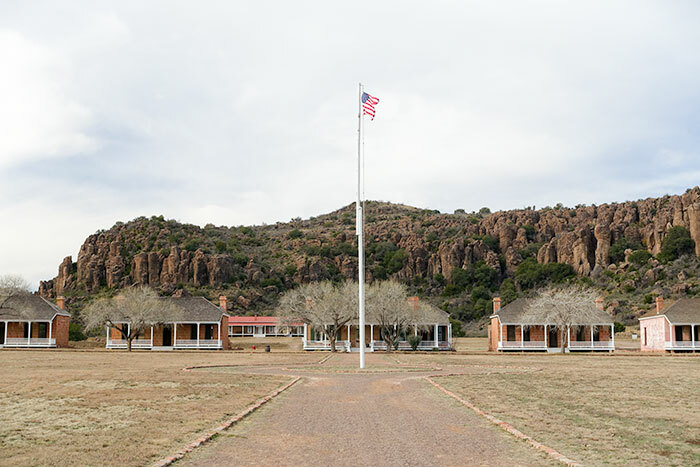 The military post of Fort Davis was established in 1854 on the site of an earlier Indian village called Painted Comanche Camp. This fort was an important defense against the Kiowa, Comanche, and Mescalero Apache Indians who lived and raided in the area. 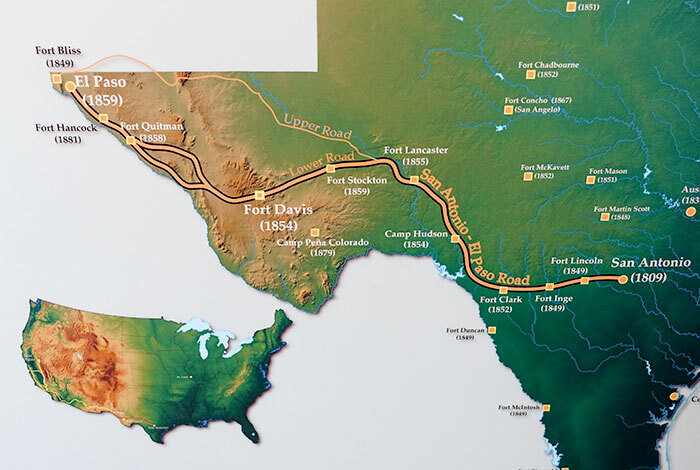 The town of Fort Davis, southwest of the post, grew from a settlement called Chihuahua and its growth and contraction closely mirrored that of the fort. The Union troops occupying the fort withdrew in 1861 after Texas joined the Confederacy. The Confederates only briefly occupied the fort but then withdrew in 1862. After Confederate troops withdrew from the fort, the Apaches attacked and looted it. The fort area remained deserted until 1867, when the army was again stationed there, including the stationing of four black regiments – 9th and 10th Cavalry and 24th and 25th Infantry. 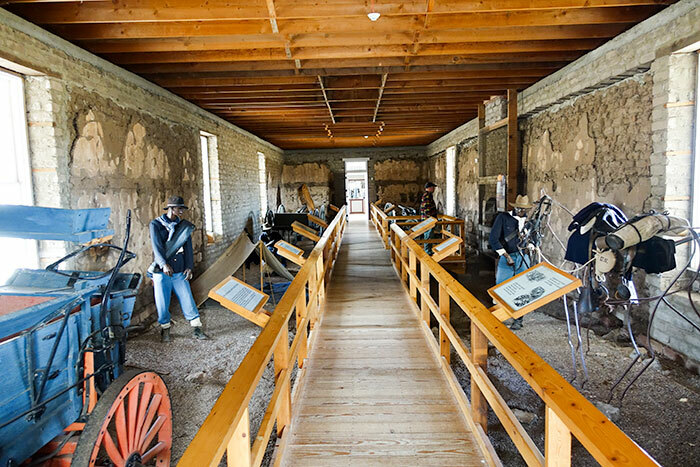 The fort was rebuilt a short distance away with stone and adobe and many of the more than 50 buildings still stand today (Fort Davis is considered the best preserved historic fort site in Texas). 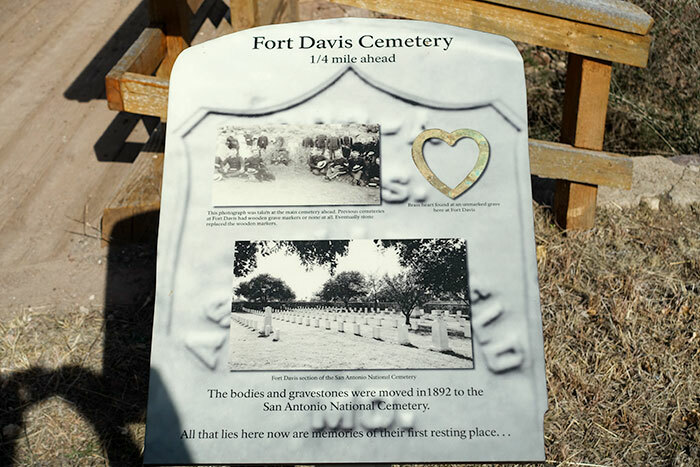 The town of Fort Davis grew as a storekeeper, baker, and butcher came as well as cattlemen and others escaping the Texas heat. By 1885 the town had approximately 2,000 people, two saloons, two churches, gristmills, cotton gins, and a newspaper. 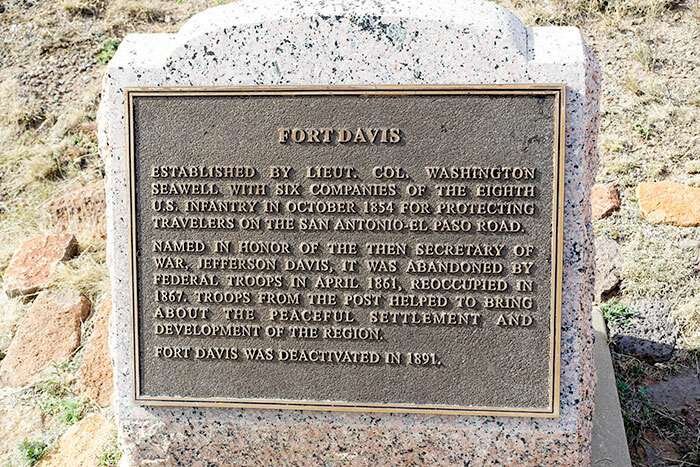 In 1887 Jeff Davis County was established and Fort Davis was named its county seat. When the army left the fort, the population fell to approximately 1,200 in the early 1890’s and by the late 1890’s was only around 500 people. The population since then has fluxuated between 700-1200 people. 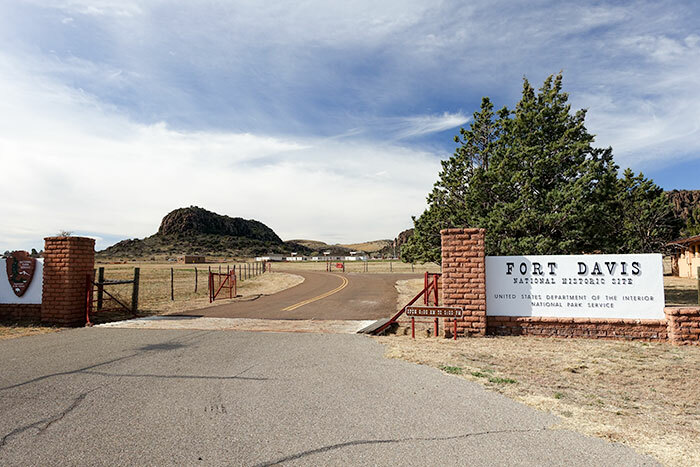 The fort property was designated as a national historic landmark in 1960 and made a part of the National Park System in 1961. 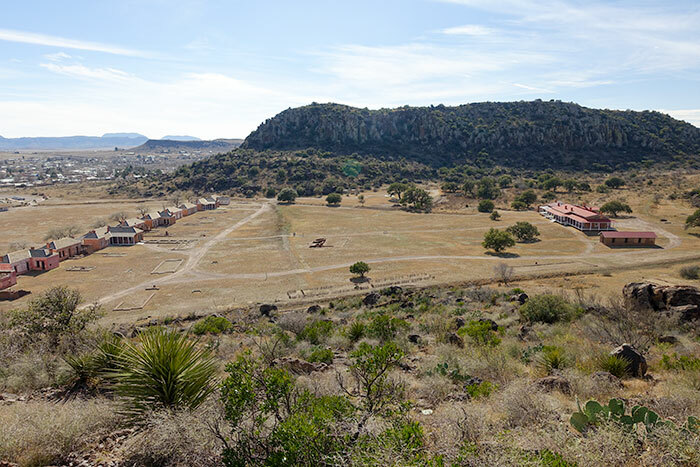 Find out more about Fort Davis National Historic site on the National Park Service website.